Having an undetected infection puts you at risk for a number of health complications, some of them severe. This is why it is critical to undergo regular checks. Consider one of our STD testing Missouri locations for your screening needs and get checked today. Most people infected with sexually transmitted diseases may not exhibit symptoms, which leads to infections remaining undetected. Undetected infections are highly likely to be spread to partners or cause health complications. Get your screening today at STD Testing Missouri location and find your peace of mind. Undiagnosed infections can lead to serious complications, including Pelvic Inflammatory Disease or infertility, if left untreated. Protect yourself by visiting a STD Testing MO laboratory today and getting an affordable screening. We offer over 60 STD Testing MO locations in Missouri. You can pick the one that is nearby and visit whenever it you have the opportunity. No appointment is necessary. Getting checked is easy with us. Know your status. 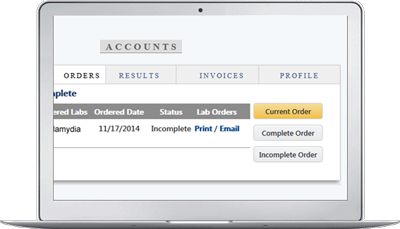 With our services, your results will be available to you online in as little as three days. If the results are positive, our clinical team will assist you with your next step. Order online or over the phone and visit an STD Testing Missouri lab locations center near you. No appointment is necessary so you can plan around your busy schedule. With over 60 STD Testing MO labs in Missouri, it is easy to find a convenient STD Testing MO lab location. There will be no exams or swabbing. Just submit a blood or urine sample. We abide by all state and federal privacy regulations, including HIPAA. Your information is always secure, from start to finish. We ensure confidentiality you can count on. All of our testing MO locations are FDA approved and/or CLIA certified, so you can rest assured that your results are accurate and trustworthy. You will receive quality care and results that you can count on at our STD Testing Missouri lab locations Missouri locations. Choose us for your screening needs and get checked for STD Testing MO today.